It's an exciting time of year---the new Stampin Up catalog, Occasions, went live today and the annual Sale-a-Bration sale began. I'd be happy to get you your own copies of these catalogs, just ask! Make January the month for lots of cards--on January 21st make 16 cards (4 each of 4 designs) and get a tin to store your beautiful cards, then on January 25th make 20 more cards and get a Hello Life black wire frame for displaying cards and photos. See class details below. January 12th, Tuesday, 7 to 9pm, make 4 birthday cards (2 each of 2 designs) featuring stamp sets from the Occasions catalog; tuition $10 or free with a minimum order. RSVP ASAP! January 21st, Thursday, 7 to 9pm, Tin of Cards kit; make 16 cards (4 each of 4 designs) and get a tin to store the cards. Class is $35 and includes the Tin of Cards kit. RSVP and payment due January 13th. January 25th, Monday, 7 to 9pm, Hello Life Project kit; make 20 cards (2 each of 8 designs and 1 each of 4 designs) and a black wire frame for displaying cards and photos. Class is $38 and includes the Hello Life kit, note cards with envelopes, and a sheet of dimensionals. RSVP and payment due January 13th. FREE! For every $50 you spend (before tax and shipping), you get a FREE Sale-A-Bration product. That means it's the perfect time to purchase those products you've had on your wish while earning getting products for free. 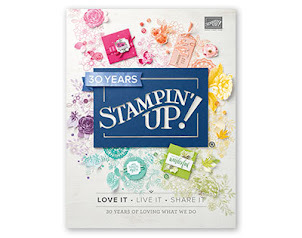 Extra Rewards Through March 31st Stampin Up is offering extra Stampin Rewards (aka hostess $$). Hold a show totaling $250 or more and receive an extra $25 in hostess benefits--for a $250 show you'd earn $50 in FREE Stampin Up products. Get a few friends together and let's have fun stamping! Contact me today to set your date. Join my Team It's the best time of year to join Stampin' Up! During Sale-A-Bration, you can join my team to become a demonstrator for just $99 and choose $30 more of FREE products for your Starter Kit (you select $155 in products for your kit). Plus, the kit ships for free! Choose me as your Stampin Up demo when you subscribe (or use the link below to automatically select me) and you get a free crafting night every month. Bring your kit to my house and get your pumpkin on! Pumpkin kit night is held at the end of the month, 7-9pm; the upcoming Pumpkin nights are January 29th, February 29th, and March 29th. Click here to subscribe (links to me) and join the fun. But wait, there are more perks for subscribing! Only kit subscribers can purchase kit refills and additional kits (while supplies last). Sign up today! Or take advantage of the SAB Pumpkin kit special---purchase a prepaid 3 month subscription on sale for just $55 and get 3 monthly kits PLUS pick a FREE SAB item. Win-win! New weekly deals! These items are on sale through midnight Monday, January 11th. New items revealed every Tuesday. Click here to go to my online store.